Corvus Belli's first foray into the world of board games, I was able to get the Collectors Edition early thanks to being a Warcor. This fall is proving to be a busy one for me, with a lot of great games coming out, and I don't want to play any less Infinity! I need more days in the week for game nights. I managed to get myself to take pictures as I opened the box for you guys, which I'm glad I did, because there's a lot in there. From beginning to end of that gallery is me digging into the box and it's contents. The miniatures and art cards come int he extra box that comes with the set, and as far as I can tell this is the extent of what makes it limited (and totally worth getting). The rulebook for the game are quite large, as you can see by the "How to Play Aristeia! booklet", though the much more useful reference guide is a handy half-page size. The artwork in all of this is just spectacular, I really cannot say how amazed I am at the quality of all the card art, and the art used in the books. The rules are written pretty clearly, but it did help a lot that my opponent for the night beta-tested the game as well. I had no idea what to expect from Corvus Belli really, considering this is their first board game, and haven't published that much original art recently. The game board is double sided, but I think it's the same layout on both sides, so it gives you a choice of art to play on. I assume the layout is set for the sake of scenarios, which will also add extra barricades in specific places, so you always know what the board layout will be. 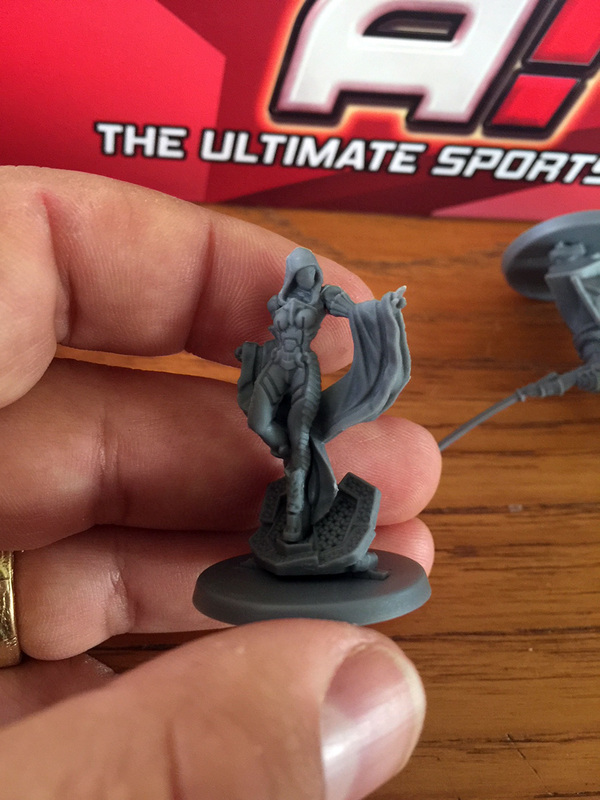 There was a ton of contention about Corvus Belli dipping their toes into the plastic miniature game, especially when it was revealed that they would be using a PVC plastic. I personally was also nervous about this, and it was one of the factors why I got the Limited Edition. Once I tore into the bag though, I could see that my fears were unwarranted. These models are well detailed, regardless of their material, and while the pewters are slightly higher quality, the plastic ones are still amazing and will look great painted. I think that any detail lost on the minis from the material will only matter to higher calibre painters, who have the talent required to make these look amazing regardless. My only issue with the miniatures is that some of them aren't sitting perfectly flat on their bases, and a few easily-fixed (with hot water) bent parts. I'll probably cut mine off and re-attach them, so they look better with basing, and I'm even considering designing some hex-bases to match the game board itself. If you're going to paint them, you'll want to clean up the flash, which there is more of than a usual model from CB, and you may want to fill a couple gaps, or repair a couple spots where injection points were, but overall nothing severe. As I mentioned, my opponent, another local Infinity player, beta-tested Aristeia! before it was launched, which gave us a bit of a head start on the rules. We decided to play through the "Learn to Play" book scenario, which was a fantastic learning tool. It effectively tells you exactly what happens in every activation for the first turn, down to the dice roll and cards in your hand. This introduction does a great job showing how all of the mechanics of the game work, so while it is scripted, it was great to see it all visually working together. After this though, you're set to finish the game yourself. I quickly learned how amazing movement and controlling your enemy's positioning was and fell in love with hEXx3r, who can push the enemy around all over the place, or lock them down entirely. The dice mechanic took a minute to get used to, since it uses it's own custom dice, but some of it felt very much like Infinity (such as face to face rolls, and being in contact with cover). To help you when you play, basically think of all the dice results being resources that you get to spend to deal damage, trigger Switches (special abilities), and to cancel your enemy's resources (your blocks cancel their hits). The game has some really fun combos that you can do with different characters, much of which revolves around moving enemy or your own figures into better positions, or stunning an enemy before attacking them with a power that gets buffed against stunned targets. While these combos are effective on the table, none of them felt over the top or game-breaking, instead it just added to a video gamey, MOBA feel, which when combined with the artwork on the cards, is just perfect. There are two levels of customization to your team in Aristeia! You can choose any 4 fighters (Aristos) to play with, and each of the fighters has 4 special cards. When you make a your deck, you will pick two of the four cards that each fighter unlocks, giving you a deck of 18 cards in total. The cards in the game are used to do all kinds of different things, such as immobilizing enemies, adding dice to rolls, and an assortment of other tricks. WOW! This is such an amazingly polished experience, I'm simply blown away it's the company's first shot at board games. Despite having a limited selection of minis, the game has an astounding amount of replay value. Since your team can consist of any of the fighters, meaning there are 70 permutations of teams that you can play just out of the box, and that doesn't even factor in the deck building. Corvus Belli has already said that they would be putting out a new set of 4 fighters every quarter, meaning each set will exponentially expand the game. I will be playing this game regularly moving forward, and I can't wait for it to come out so I don't have to share!